This weekend, from 24th to 26th June use a [Magnifying Glass] to inspect your Dungeon Chests at the end of the run and you’ll be rewarded with an item from the Bonus Magnifyque Chest for each [Magnifying Glass] used! 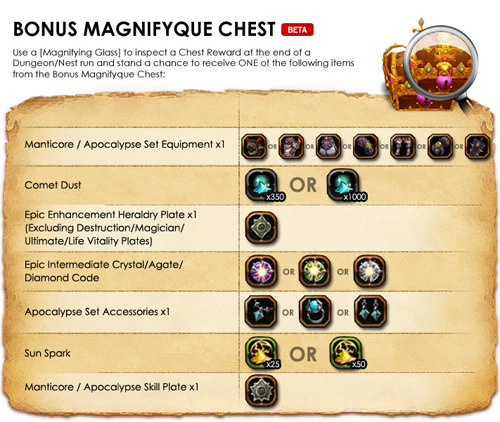 You can get as many items as you want from the Bonus Magnifyque Chest within the event period. The Bonus Magnifyque Chest contains some truly Magnifycent Rewards, so hop on over to the Cash Shop and grab some [Magnifying Glass] to Magnify your weekend today! - More rewards are added into the reward list. *Note: All [Magnifying Glass] used on 23 June 2012, from 0000HRS to 2359HRS (GMT+8) will also be counted in for the rewards offered in this promotion. groaaaa.. aku cm dapet manti helm yg plg bagus..